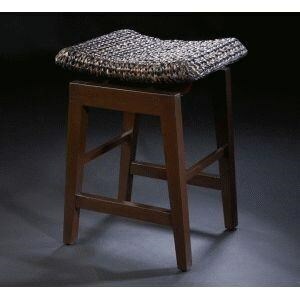 Sophisticated, yet relaxed, this counter stool features a raw abaca weave seat for tropical flair. Tapered legs in a dark wood finish add sleek, contemporary appeal. Use the counter height stool at your kitchen counter or bar space for a stylish and practical tropical accent. The Ceylon Counter Stool by C.S. Wo & Sons at C. S. Wo & Sons Hawaii in the Hawaii, Honolulu, Oahu, Hawaiian Islands, Waikiki, Diamond Head, East Honolulu area. Product availability may vary. Contact us for the most current availability on this product. The Ceylon collection is a great option if you are looking for Tropical furniture in the Hawaii, Honolulu, Oahu, Hawaiian Islands, Waikiki, Diamond Head, East Honolulu area. Browse other items in the Ceylon collection from C. S. Wo & Sons Hawaii in the Hawaii, Honolulu, Oahu, Hawaiian Islands, Waikiki, Diamond Head, East Honolulu area.